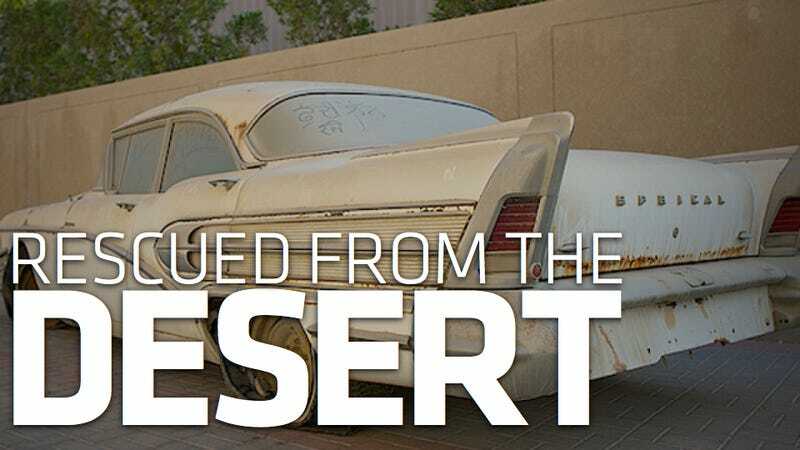 After discovering the wasting of a Jaguar XJ 220 and the Ferrari Mondial, Phil McGovern of Crank & Piston came across another cache of automotive iron abandoned in the Middle East — this time with a different ending. — Ed. We have been quite lucky over the past couple of years when it comes to hunting down - and showing the wider world - some pretty cool old school metal. Unfortunately, a lot of it has been left on the side of the road to slowly rot away into the earth. From the Jaguar XJ220 to the Ferrari Mondial, the stories have touched a spot with people and petrolheads alike. Syndicated across the world and spread across facebook and twitter like wildfire, the pics have found themselves appearing in all sorts of places. There is however a very different story behind these pics as opposed to the shots of that Ferrari. What you may ask? Well, this collection of cars have actually been rescued from their death beds and are sat patiently in line awaiting a thorough concours revival. That's right, each one of these awesome vehicles will be coming back to life wearing a new dress and treads. We can't wait and will be there every step of the way bringing you the color as it appears. This story and photo gallery originally appeared on Crank & Piston on March 1, 2011, and was republished with permission.